Salmonellosis of sheep is an infectious bacterial disease causing illness and death. It results from proliferation of salmonella bacteria in the gastrointestinal tract and other organs. Profuse diarrhoea is commonly present and pregnant ewes may abort. There are more than 2000 serotypes of salmonella worldwide, but in Western Australian sheep the serotype that usually causes salmonellosis is Salmonella typhimurium. In sheep flocks, about 2% of animals may be carriers and may spread the bacterium through a flock, precipitating outbreaks. Salmonellosis of sheep can resemble some exotic diseases including Peste de petit ruminants and Rift Valley fever. If you see unusual disease signs, abnormal behaviour or unexpected deaths in your stock, call your private veterinarian, your local DPIRD Field Veterinary Officer or the Emergency Animal Disease hotline on 1800 675 888. Salmonellosis is a zoonosis, which means it may spread from animals to cause disease in humans. Take careful hygiene precautions if you suspect salmonellosis in your sheep. Salmonellosis may occur in sheep of any age, breed or condition, and in both sexes. It occurs more commonly in winter and spring, but it may occur at any time of year. Stress and high stocking density are common precursors to outbreaks. High stocking densities occur when sheep are in open feedlots or housed, and also when sheep congregate because of supplementary feeding, limited feed or water sources, or flooding. The risk of a salmonellosis outbreak increases if other stressors are also present, such as more than 24 hours without feed, long-distance transport or droving, shearing, or cold, wet, windy weather. Heavy worm burdens, particularly in young sheep, and water deprivation (for about two days or more) in summer may also precipitate outbreaks. Stress lowers the resistance of carriers, allowing their resident salmonella bacteria to multiply rapidly. Then, particularly when the stocking density is high, faecal contamination of feed and water may result in an outbreak of disease among other similarly stressed sheep in the flock. What are the signs of salmonellosis? In a typical outbreak of salmonellosis, some sheep will be found dead and others acutely ill.
abortion in pregnant ewes (aborted lambs may be the first sign noticed). To diagnose salmonellosis in sheep, a veterinarian needs to submit a range of fresh samples from a post-mortem to a laboratory for testing. khaki-coloured diarrhoea, containing mucus or blood flecks. How should I treat sheep affected by salmonellosis? Move unaffected animals from the group from the area where the outbreak occurred to fresh ground where they can spread out. Provide clean, plentiful water and improve their nutrition. Good quality hay may be attractive if their appetites are poor. Minimise any further stress, especially mustering and yarding. Where practical, clean and disinfect yards, feeders and water troughs, using 5% formalin or other effective disinfectant. It is not acceptable to let a salmonellosis outbreak run its course. Owners/managers must take action to stop the outbreak and treat or humanely euthanase severely affected animals. A veterinarian can advise on treatment options such as fluids and antibiotics for affected animals. How can I prevent salmonellosis occurring in my sheep? It is not practical to identify or eliminate carriers of salmonella bacteria. Try to avoid the stressors described above whenever possible. Good nutrition, effective parasite control, and management practices that eliminate long periods without feed or water will minimise the risk of salmonella outbreaks. 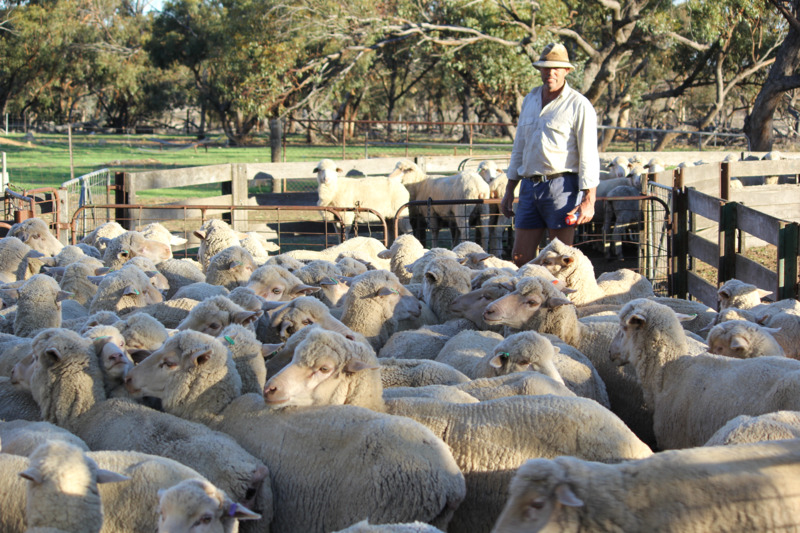 There is no vaccine available in Australia for salmonellosis in sheep. Salmonellosis of sheep can resemble some exotic diseases including Peste de petit ruminants and Rift Valley fever. It must also be differentiated from other causes of diarrhoea, including coccidiosis, campylobacteriosis, arsenic poisoning or severe intestinal worm or worm larvae infestation. Ruling out reportable or trade-sensitive diseases supports Australia's continued access to livestock markets. If you see unusual disease signs, abnormal behaviour or unexpected deaths in your stock, call your private veterinarian, your local DPIRD field veterinary officer or the Emergency Animal Disease hotline on 1800 675 888. DPIRD field veterinary officers can provide more information about salmonellosis. To find the contact details of your closest DPIRD field veterinary officer, go to the Livestock biosecurity program contacts page.